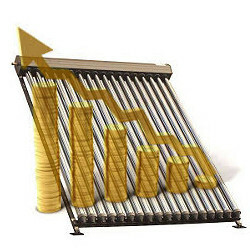 Home » Solar Thermal Information » Is solar thermal worth the investment? Is solar thermal technology a good investment? Before deciding to install a solar thermal system, it is vital to consider a wide range of factors. Most solar thermal systems are ideal for domestic use, though if you are a business or organisation that uses large amounts of hot water (such as restaurants, hotels, schools, hospitals etc. ), solar thermal may also be suitable. It is also possible for communities to install communal solar thermal systems. We highly recommend looking into Thermodynamic Systems for large scale or commercial hot water applications, this is due to the better ROI and quantity of hot water produced day and night. It should be noted that solar thermal systems are not able to produce all of a property’s hot water demand. An average UK household requires between 3000kWh-5000kWh worth of water heating annually. A solar thermal system may provide between 40% and 60% of this. During the summer, when solar radiation is high and hot water demand is lower, a system may provide all of your property’s hot water, meaning that you may not have to run your boiler at all. During the winter months, however, when the hot water demand is higher and solar radiation lower, a solar thermal system will only provide around 20% of your water heating needs, meaning that you will need to use a backup heat source (such as coal, electricity, gas, LPG, oil). Solar thermal panels are also suitable for new-build domestic and non-domestic properties – there are even ‘in-roof’ panels available which perform the function of both a solar thermal (or photovoltaic) panel and a normal roofing material. This is a relatively new technology, but is becoming increasingly popular with architects and developers looking to create a green home or business space.